The Osprey Campaign series of military histories contain three "Battle-scenes" in each book which are the author's responsibility so far as research is concerned. I am currently writing one on Operation Dragoon, the Allied amphibious landings in southern France on 15 August 1944. One of the battle-scene plates deals with a missile attack against the Allied fleet by KG.100 "Wiking", the Luftwaffe's premier anti-ship missile unit. This unit was involved in the earlier Hs.293 and Fritz-X attacks on Allied ships in the Mediterranean in 1943 and off Normandy in 1944. After being decimated in the Normandy fighting, the hodge-podge of Do-217E-5, K-2, K-3 and M-11 were consolidated into III./KG.100 and sent into action off the southern French coast on August 15-16. 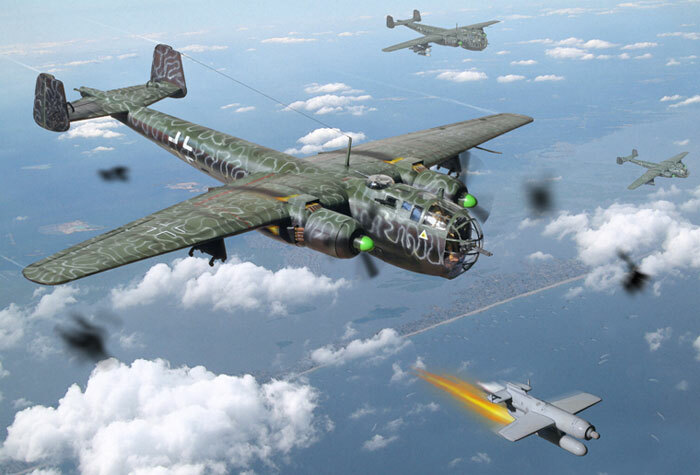 This was the last successful use of these early guided weapons, and the only significant Luftwaffe operation against Operation Dragoon, so it seemed a natural subject for one of the plates. From an author's standpoint, the main problem with providing the Osprey artist with references for this action is the relative lack of good illustrations of these aircraft. This is where modeling comes in handy. I built an old Italeri 1/72 Do 217K-2 as the centerpiece (built as a K-3), courtesy of Al Boone's stash, and Art Loder helped with the reference work. The Hs 293 missile in the illustration is actually from the 1/48 Monogram Do 217E-5 which is somewhat better detailed than the Italeri missile. After building and painting the various models, I photographed them with my digital camera (Canon EOS Rebel) and imported the images into Adobe Photoshop. The background photo was actually taken over the US Atlantic coast while returning from a trip overseas. I usually keep my camera handy while traveling as it is a good way to build up a stock library of images such as skies, clouds, aerial views, etc. The various bits and pieces were assembled in Photoshop, and extra details added like the flames, the ships in the water, etc. Once completed, I applied the Photoshop Filter/Artistic/Watercolor which somewhat simplifies the image and makes it look more like a painting and less like a model photo. The model work on this probably took 10-15 hours and the Photoshop work and photography took about 6 hours.